As I am sure most of you have seen in the last few years a shift in marketing. The public is beginning to no longer tolerate marketing and branding that is superficial. With the explosion of social media, brands that are authentic and transparent are the ones seeing HUGE success. Is your marketing and branding transparent, does it move people in a positive and genuine way? I don't want to get on my soapbox, but today is one of those days. In recent weeks I have seen a large influx of brands and celebrities taking a stand to be authentic and use their marketing to cause REAL change in our culture and our thinking. These few examples below have seen the way our culture has been affected by superficial marketing and making women feel they are incomplete the way they are. Colbie Caillat cannot stand the way the Photoshop and brands have displayed women in marketing and she is using her brand for change. She is completely transparent and vulnerable for the world to see in her latest song "Try" and this not only has gotten her publicity, but genuinely helps women feel confident in their own skin. The Always brand has chosen to not just sell a product, but use their marketing to create change in the mindset of how women are viewed. Up and coming artist, Meghan Trainor recently released her first single "All About That Bass" and it has gone viral. Through her self-acceptance message in her music she has become a sensation overnight. What do these examples mean for YOUR marketing? Fans will rally behind brands that show who they are to the public. These brands and artists are taking a stand for what is important to them...do the same in your marketing. Don't get stuck behind selling a product or services, but realize every interaction with your customers is an opportunity to add value to their day. Making their day better will build a stronger tie to you and create brand advocates who will vouch for you. From these examples you can see how being authentic and making positive changes in the lives of their audience has helped them see results overnight! This is not always the case, but brands that add value and take a stand for authenticity will win in the end. What are your favorite brands that are transparent and cause positive change in your life and/or business? Comment below and continue this discussion. Most businesses today know they need to have a presence online and to many it means building a website to drive business. Unlike what most people think, a website should not just be a simple brochure or place to tell prospects what they do, but your website needs to have a strategic goal. Your website should be designed to drive traffic to reach the goals you have set. Let's take a look at website that Speakeasy had the pleasure of creating. Difficulty reading the font due to size. Multiple fonts and colors not branded together. Links that were not displaying properly. Overall very busy and difficult to navigate. From the interior page you can see there was room for improvement. And so I, along with my designers began the process of refreshing their website to reach their goal of increasing applications and making the process of applying for positions seamless. Below is our final product which you can view for yourself at BiosCorp.com. So what makes this redesign reach their goals and an improvement from their previous site? The branding is consistent throughout the website. 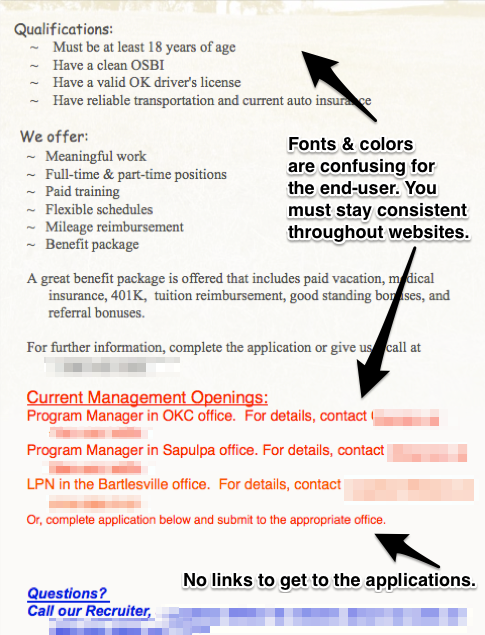 It is very apparent this site is driving people to apply to work for them. The interior pages feature their employees and people they work with, which expresses the culture of the company. The site is easy to navigate and viewers can easily get reach their desired area of the site within a few clicks. Social media is easily seen and viewers can connect with Bios quickly. You may be thinking, Kersten that is great you were able to help your client, but what do I need to know when I am building my website. Start with these questions in mind before you begin the process of building a website. What is the goal of your website? Are you wanting to increase sales, purchase something online, and/or have prospects call you? When people see your branding and marketing materials do they know what you do? Does your branding express your company culture? Taking time to think through and answer these questions is your first step to creating or updating your digital marketing. The following are key points to keep in mind when you do begin updating your digital media. Be consistent - Your branding needs to be consistent across ALL platforms, both digital and traditional. Keep it simple - Visitors of your website need to be able to easily navigate your website in as few clicks as possible. Express yourself - Your company has a culture and brand that needs to be expressed in your marketing. Brands that stand out and are not afraid to show their colors are the ones that will see success, especially in the digital world...it is all about TRANSPARENCY. If you are ready to begin the process of updating your website and/or branding and would like a consult, simply contact me by sending me an e-mail or message me on your social media platform choice (you know I am on all of them...it's not like social media is my life ;) Also if this post was helpful to you, comment below or share it using the buttons below. P.S. Send my client BiosCorp some social media love and visit them on Twitter, Facebook, or LinkedIn. 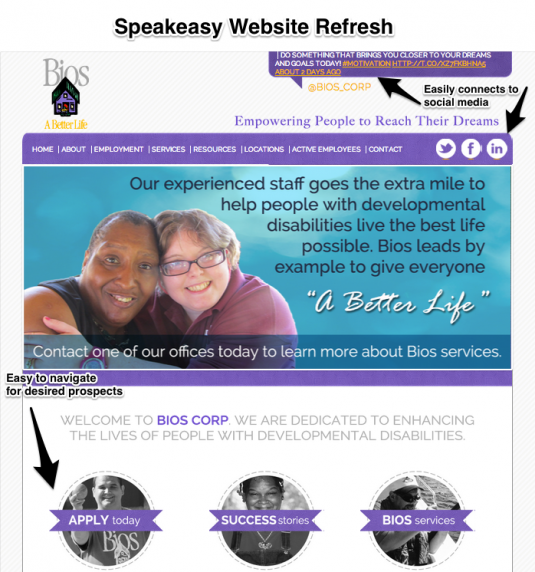 Whether you are from Tulsa or not, this Speakeasy website case study can help you and any company thinking about creating a website with some tips and tricks of web design. When the client came to me, the goal of the site was to create less questions for them to manually answer and for their website to be a place of information for prospects and ultimately to weed out those who were not serious about booking. When creating a website, no matter the industry, the end goal is to drive sales and business, whether that is through e-commerce or being information driven. When designing a website you must take this into consideration and make the site as user friendly as possible while also creating an aesthetically pleasing experience for them. Now lets take a look at the before and after shots of a well known event and wedding venue here in town, Harwelden Mansion which Speakeasy has the pleasure of working with. Easy to navigate - Whether you are wanting to host an event or wedding, it is very clear to the user which areas of the site are meant to meet your needs through large buttons on the homepage. You do not have to slide through banners but are able to quickly find what you need in a short amount of time. Branded logo - Before Speakeasy came in, the mansion had an image of a concrete "H" that is located on the actual building. Although it is a lovely image, it is difficult for that to translate digitally and use on promotional products like business cards, brochures, etc. Speakeasy came in a revitalized the logo to create something that would work well for them in print and web material, as well as something that people would begin to recognize as representing Harwelden Mansion. Clean design - The previous website was full of content that was irrelevant to prospects booking the venue and much of this excessive information cluttered the homepage. We condensed and rewrote content to fit their needs and get to the main points that would meet the needs of clients. The site now allows people to easily find what they need and does not overwhelm their eyes. Use of Imagery - This venue is a Tulsa icon and needed to be shown in a new light. Through the use of updated photography and including images of recent events and brides, the mansion can now be seen in a new light as something that is appealing to more generations and their target market. Social Media - Yes, of course brides and events need to be represented on social media. The previous website made it difficult to find the social media icons. The clean design of the new website makes it easy for visitors to interact with their social media and even share the content, such as the Pinterest "Pin" images option throughout the site. The more people you can get to share your brand the more awareness and ultimately sales you will generate. Removal of contact form - the removal of the contact form within every page of the site helped to filter out prospects that were not fully interested in the venue. Prospects that truly want to know about the venue have to make the conscious effort to contact the venue by navigating to the proper page, which means they will spend more time clicking through the site. Now to recap what are some keys to a successful website? Ease of use - the ability for visitors to quickly and easily be able to navigate your website in as few clicks as possible....because lets be honest we are all busy and don't have time to click through a million pages to get information we need online. 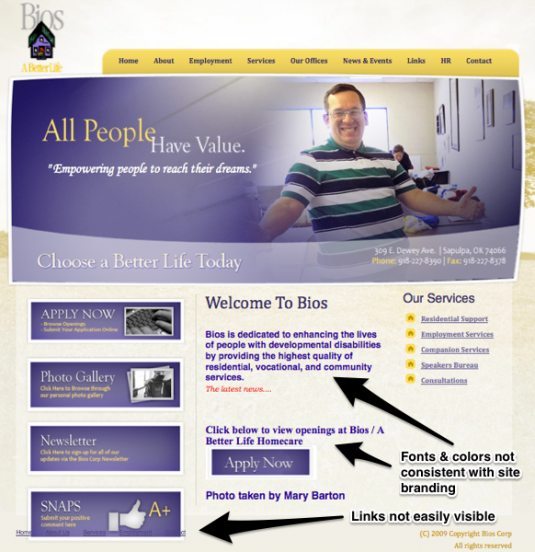 Branded design - your website needs to represent your company and its brand...period. Across your web platforms, (website, social media, etc) your brand need to be consistent. Drives sales - Your website is a sales tool, which means you need to treat it as such. Make sure your website directs visitors to meet your goals and to be able to easily do business with you. Create a fan base - Allowing visitors to interact with your brand via social media will begin to foster a group of cheerleaders and brand advocates for your company. Of course you must interact and create a reason for them to vouch for you with your social media...but that is a post for another day. 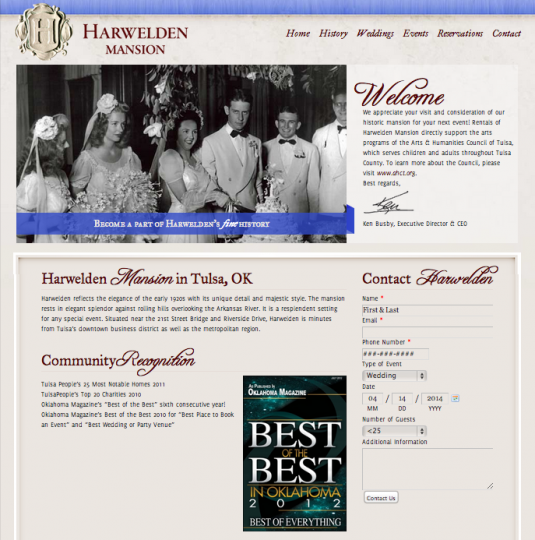 As you can see the revitalization of Harwelden Mansion, a Tulsa icon is now ready for the next generation of events and weddings. But a website is merely a stepping stone in the marketing of a business. If this post helped you or opened your eyes to the next steps for your digital marketing feel free to share it. If you would like a FREE consultation and review of your current digital marketing contact us today to get started. Creating a website and marketing plan should not be a daunting task, so let Speakeasy Market Strategies help! The biggest question I am asked from business owners is...."What social media platforms should I use for my business?" It is a great question and one that is not easily answered as not all social media platforms are created equally. As I am unable to speak to specifics, I will give a few guidelines for various platforms to assist in your social media efforts. Just as this quote states, the key to picking a social media platform is choosing the ones that the majority of your customers are on. Some companies have the resources to be on all social media platforms, but for most businesses social media is time-consuming which is why you must pick the platforms that will give you the best reach and engagement with your customer base. For the time being Facebook is still one of the most widely used social media platforms for businesses today. One of the things I like about Facebook is the customization control you have on Pages and this allows you to direct people to the areas of your page using 3rd applications. Since such a large majority of the population is on Facebook it is likely that your customers are on this platform. Of all the social media platforms, Facebook is the one that has the best and most strategic advertising options as well. This means if you want to invest in advertising on social media, this is the platform that will allow you to target more narrowly than the competing social platforms. So as a general rule, I normally recommend the majority of businesses to have a business page. Twitter in my opinion is a platform that has a lot of functionality to create conversation with customers and it is far easier to gain a following on Twitter more quickly than other platforms (granted there are strategies to do this). The problem with Twitter is that this platform can feel hit or miss if you are not using it properly and do not understand how to use it...such as the use of hashtags. As a general rule I always encourage brick and mortar businesses for have a Twitter account since it is far easier for a customer to tweet at you at your location than searching for your other social media platforms. Also if you are planning on hosting events I recommend Twitter as it can be used for easily tracking conversations using hashtags. LinkedIn is the best platform for B2B businesses. This platform features your professional self and is great to connect with other businesses. Do not expect to be pushing much B2C business, but for those of you wanting to get your foot in the door and network, it is the platform for you. The key to LinkedIn is being consistent and sharing content that is valuable and not continually self-promoting. People want to grow professionally on LinkedIn and if you add to their growth through sharing knowledge they are more likely to do business with you. If you have a website that is very media and photo heavy, Pinterest may be for you. The main goal of Pinterest is to be a source of website traffic, which is done through "pinning" images from your website. But be careful, promoting too much of your own content and not engaging on other content on Pinterest is social etiquette faux pas. For general industries that are popular on Pinterest, simply take a look at the large search categories, such as Weddings and Food & Drink. Nor for a platform that is even more photo friendly...we have Instagram. This platform has gained a lot of exposure lately and will continue to see growth in the years to come. This platform is becoming popular because it seems to be a quieter space as compared to platforms like Facebook and Twitter. Businesses that will see success on Instagram are those that produce quality photos. Typically businesses that are B2C tend to have better success on this platform. If you are unsure if you should engage on Instagram, think through the eyes of your customers and whether they would likely engage in photos of your business and its culture. Vine is a relatively new platform and many brands are getting on the Vine bandwagon. In my opinion Vine is great if you have creative video concepts. If you struggle with creating lots of creative content Vine might not be for your business. This platform is a large form of entertainment so if you are going to engage, be entertaining as those are the videos that will be more likely to spread. Now YouTube may not seem like a social platform, but it is. Honestly I wish that most businesses were on YouTube as it is a HUGE driver of SEO for your website and online traffic. YouTube is owned by Google and if done properly will get your better results than blogging alone. Most businesses think that in order to see success as a brand on YouTube that you must have professional videos, which as we all know can be extremely costly. In reality the key to YouTube is adding value to people and that is more important than spending tons of money with professional videographers. I always recommend having a few professional videos for your website, but simply using your computer camera is enough to get your point across on a daily basis. If you would like help figuring out which social media platforms you should invest your time and energy on, email or contact me today. If this post struck a chord with you and you are ready to increase your exposure online, then look no further. I am here to help you be able to get back to what you do best and I can handle the rest. Mentoring has been a key to building up employees for centuries....but picking a mentor within your organization or mentoring an employee should be only a fraction of your mentoring ability. When I was job hunting right out of college, training and mentorship were a vital factor in the companies I chose to interview. How else would I grow in an job if there was no one within the organization that was willing to teach me the path to success. Unfortunately while I was job hunting I found something disturbing in today's workforce....very few companies valued mentoring. Most places I interviewed with were surprised at my desire to learn the basics of a business and work my way up. It was only later that I realized that most of these managers were more concerned about their own skin than training an employee to excel in their job. Now years later it was this and so many other lessons that drove me to start me own business, but in the process I completely lost the opportunity to have a co-worker mentor me. While growing my business I began to network and soon discovered the need to find men and women that could be a soundboard of wisdom as I entered my new venture. It was during my networking events that I encountered individuals that took the time to invest in me and my future. It is because of my networking that I avoided many pitfalls within my business when I first started. Pick mentors from different backgrounds and even industries. People from different walks of life will have a different perspective and you will have access to a larger knowledge base. Pick mentors that have seen success. When picking a mentor you want to pick ones that have reached a level of success that you wish to reach in the future. This does not mean they must be in your industry, but they have seen success and failure in their career and learning from them will help you grow. In order to reach success they will have had a few failures and the lessons from those experiences your mentor had could help your future. Make sure there is room in their schedule. Executives and business owners are playing a balancing act and you do not want to add to their stress by sucking away their time; therefore be mindful that you pick people that do have a little wiggle room in their schedule. You do NOT need to meet with them constantly but ask to pick their brain every once in a while and ask for the expertise. As the quote above states....networking and mentorship are blurring....do not miss out on the opportunities to mentor or be mentored. You must take the first step towards growth or helping someone grow. Leave me a comment below and let me know the experiences you have had in "Mentworking." If you are seeking a mentor and would like to connect, click the “Contact Us Now” button and I would love to be of assistance. Is Traditional Advertising Right for Your Business? As a marketing consultant I constantly get asked the question....should I advertise in TV, radio, in this publication and that. Today there are so many options on where businesses can advertise that it can truly overwhelm businesses. Some businesses have large ad budgets so they can risk throwing money at multiple avenues, but for small business owners one wrong advertising decision can mean creating very thin margins and the stress of paying bills. Over the years my solution to this problem is two-fold. Here is the process I guide my clients and my own business through on a regular basis. Businesses are constantly asked to advertise, especially new businesses. When I worked at a boutique hotel right out of college it seemed as if every advertising avenue knew I was new in town. Within a month of starting I was approached by almost every publication in town...the Tulsa World, Tulsa People Magazine, Oklahoma Magazine, Brides of Oklahoma, and various others. Every single publication wanted to show me their reach and all of their stats, which to a non-marketer looks appealing. But you must take a look at each publication and ask yourself if your target market is within the advertisers target market. The point of advertising is reaching customers who align with your business which is why choosing correctly is key. The main element that helps solidify if you should advertise with a certain company is checking with their current customers. Look to see if there are companies in your same industry within the publication....next pick up the phone and start calling some of the companies already advertising with them. Ask these companies if they have seen increased exposure and customers in their business since advertising with the company. If they say they cannot tell, then odds are that it is not worth it to have a presence in that company. Another few items to think about....advertisers will always puff up their stats to get you to buy on the spot. Don't be swayed by numbers but take your time to do your homework to see if it is a right fit. Another pitfall many places try to catch companies in is social media. Many will say that they will promote you on social media and use their large following base to impress you. Again...DO YOUR HOMEWORK....they may have a large following but look to see how they are promoting their current advertisers. As many of us know just one post a month will not reach all of their followers. There are many factors that go into getting the most exposure you can out of social media but advertisers that throw social media around as a huge perk to advertising is all smoke and mirrors...do not be deceived. If you decide that there is an advertisement avenue that fits your needs and is a good fit for your target market, the next thing you MUST do is track your ad. Simply having an ad is not enough if you have no way to track the tangible results of the ad. Examples of this include a special promotion that you are only running in that publication, such as free coffee with purchase of x. You can have keywords in your ad that customers can say at checkout and then your employees can track how many people are redeeming your ad. Another clever way you can track information is having a phone number on the ad that is used only for that ad (you can easily get a free Google Voice number and use that so you can track how many calls you receive). This may sound like a post against most traditional advertising, but I assure you it is not. In my experience though many advertisers are just trying to make their sales numbers and do not really have a heart for helping your business. It is because of this that I implore you to proceed with caution if you are planning on advertising. You always want to choose the marketing options that are going to give you the best ROI...it may take time but if you use these suggestions you will be prepared to find the right advertisers to help your business. If you would like business counsel on advertising and your current marketing strategy, give me a call. Click the “Contact Us Now” button or call the number at the bottom of the screen to get started. If you would like a sample of the ideas we could generate to help your business, click here for a free digital marketing report, custom-made for your company. Even if you are not in Tulsa, I also do have consulting available for you to purchase to get one-on-one help from me to kick-start your next project, company, idea…the skies the limit. Click here for more info on those services.